Taking an optimistic view, it is possible to think that we might be living in a transition period where people can evolve towards what I call “Homo Mindfulnus”, and here is a possible story of how this may happen. Although the story did indeed begin over 2500 years ago in India with the ideas of Mr. Gautama, more generally known as “the Buddha”, the trajectory to get there is taking some detours. As a derivate of the Enlightenment period, two connected views emerged amongst others: the Cartesian view of man characterized by “cogito ergo sum”, in other words the idea of the rational decision making man, and second Adam Smith’s self-interest postulate, the idea that man is naturally programed to pursue his own interest out of his own need for survival. 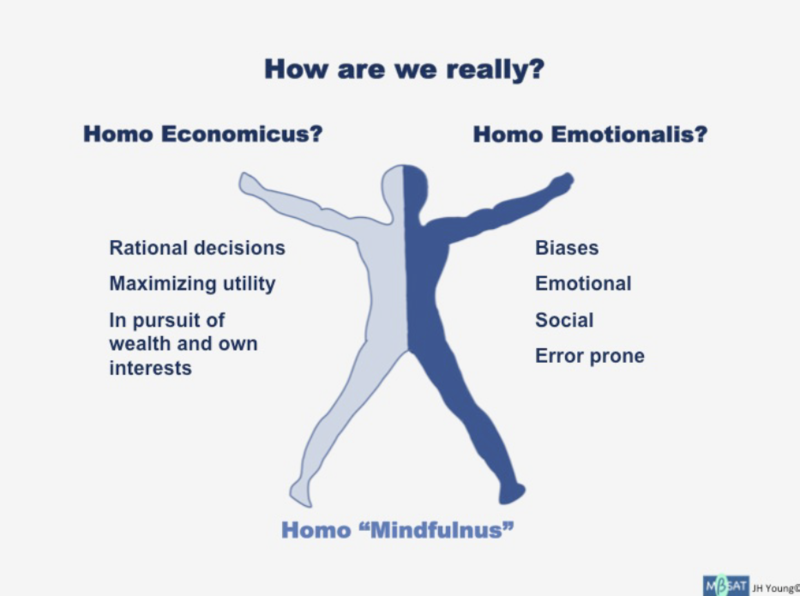 The contemporary view of Homo economicus originated when amongst others some UChicago economists merged these two postulates to create theories suggesting that people base their life decisions on a rational pursuit of value that leads to maximizing their utilities (happiness, wealth, and any other desirable good). Given the zero-sum effects (one’s gains come mostly from someone’s losses) of these theories this implies the assumption that individuals must act selfishly to have any hope of realizing their aspirations. While economists were worshipping their highly rational views of man’s behavior, other social scientists were casting doubts about their validity. H. Simon, a political scientist who won the Nobel Prize in Economics for his work on bounded rationality, suggested that human beings have a limited capacity to process information, which makes them incapable of being totally rational in their decisions. D. Kahneman, a psychologist by training who also won the Nobel Prize in Economics despite not being an economist (!) demonstrated with his Prospect Theory of human behavior that people process information using two systems: (1) they either use heuristics/shortcuts thus a more intuitive way of processing and making decisions, or (2) they make decisions more slowly and rationally based. Thus, in some cases people are more spontaneous, meaning more emotional and intuitive, and in other cases more deliberate and more rational. This year, R. Thaler who graduated at Case Western Reserve University, also my alma mater, and professor at Booth School of Business at UChicago where he teaches at the behavioral science unit, won the Nobel Prize for his theory of “Nudging”. It proposes, that people in positions of responsibilities should create environments (a choice architecture) that nudge people’s decisions towards objective, sustainable welfare. In fact this theory also implies that people are not totally capable of deciding rationally as they are in need of external support in making competent decisions. The intense attention and interest that mindfulness is getting from different sectors of society: health, education, politics, family and business is indeed impressive. We can ask ourselves: Could it be that we are realize that embedded in mindfulness teachings and practices are possible answers to some of the great challenges we are facing in this world characterized by increased volatility, uncertainty, complexity and ambiguity? A world where either purely rational or spontaneously creative solutions seem not enough to help people achieve their individual and societal potentials so they could live with more authentic happiness and less suffering (war, unemployment, inequality, health systems and social safety nets under pressure). Yes, is my answer, I think people are indeed beginning to see the great potential of mindfulness as a force to improve the human condition. 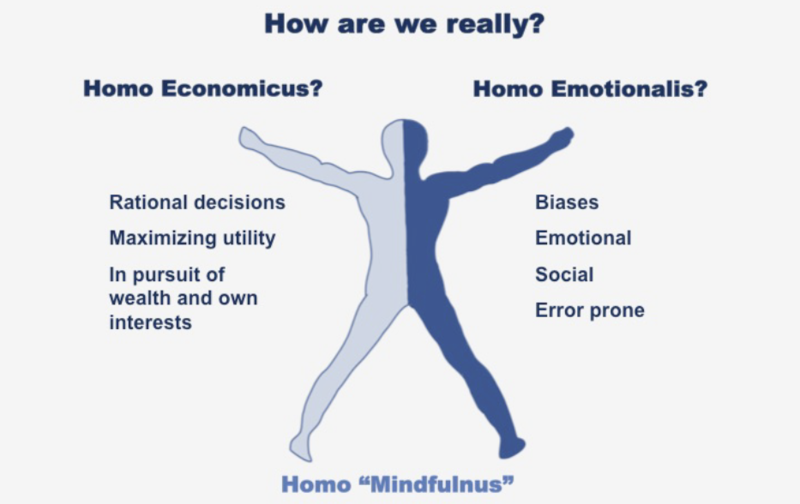 Based on habits we process the experiences of our life either as rational Homo Economicus from our unconscious, “rational”, conditioned and fixed mental patterns (pre-established views, prejudices, theories, etc.) or as Homo Emotionalis from our preset reactive emotional preferences (I hate this, I love that, etc.). On the other hand, as Homo Mindfulnus we learn to process the experiences of our life from the full fluidity of our humanity: our Body sensations, our Emotions, Thoughts and Actions impulses, what I call BETA. With mindfulness-based approaches we learn to engage our BETA in a dynamic self-caring process of discovering our ongoing experience with curiosity. The first step consists of Catching our BETA which simply means that we are able to achieve some coherence of what is happening with us at the moment. I call the second step Engaging and Evening out our BETA, meaning that we are able to stabilize and crowd out any agitation clouding our experience. Finally, with Opening our BETA we can, if we so choose, embrace and be open to our momentary experience, thus cultivating a stable and expanded BETA so that our awareness can become more strategic and facilitate skillful decision making conducting to a more fulfilling life for us and others around us. 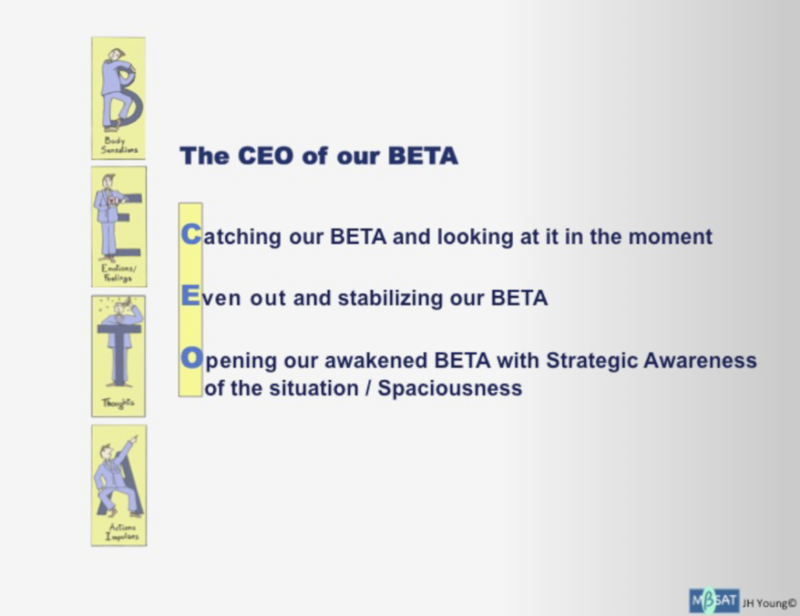 These three steps of Catching, Evening-out and Opening our BETA, what I call “CEO of our BETA”, can be at the heart of helping people live a mindful life. 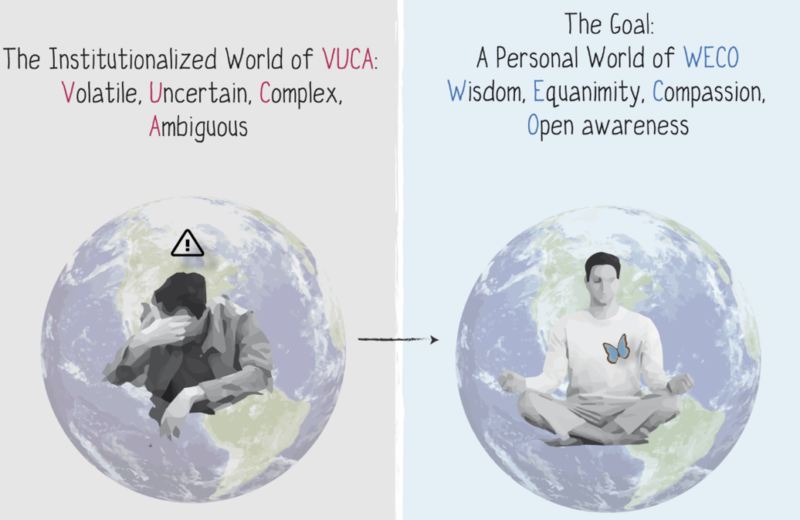 It is with the minding of our full human experience through the mindful process of “CEO-ing” our BETA that we can create the potential for moving away from the world of Volatility, Uncertainty, Complexity and Ambiguity – VUCA and gently guiding ourselves towards Wisdom, Equanimity, Compassion and Open awareness – what I call the WECO space, the space where life is worth living.